I have been interested in airplanes and flying ever since I was a little boy; it’s in my blood. My grandfather spent his working life as an airplane mechanic, a long haul cargo pilot and a flight engineer for TWA. Other family members who are pilots include my uncle, my second cousin, my great uncle, and most recently, my dad, who earned his license six years ago. 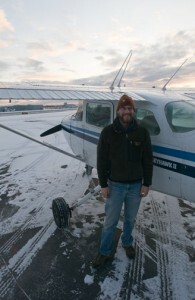 Although flying has always been a lifelong dream for me, it always seemed out of reach, both financially and mentally. I suppose I always knew that I’d work towards being a pilot someday, but I’d always assumed that it would something I did later in life. So I bought a flight simulator program for my computer began using it and learned a little bit about flying, thinking that this would satisfy my craving. It didn’t. It only made it worse. Finally giving in, I went over to the field, found a flight school and signed up for an introductory lesson. This blog is a journal of my flying experience from the very beginning and where it goes is as unknown as where flying will take me in the coming years. It’s mainly a journal for myself, but if you should come along and read some or all of my entries, then I hope you enjoy it. Great Site Dan, beautiful images also! Just wanted to drop you a note and let you know how much I enjoyed your blog!